Discussion in 'Rick Middleton's Pron 'Stache: Bruins Forum' started by soxhop411, Sep 30, 2017. 1st: why is he bringing this up now and not when Vegas was in the early stages of getting an NHL team?, What has changed in the 4+ months since Vegas was awarded an NHL team. 2nd: Why only the casinos "adjacent to the arena"? If someone wanted to bet on the Knights they could just drive further down the strip and bet on them at a different casino. 3rd: Don't 95% of sports books have a mobile app? Cant someone just bet on the app? 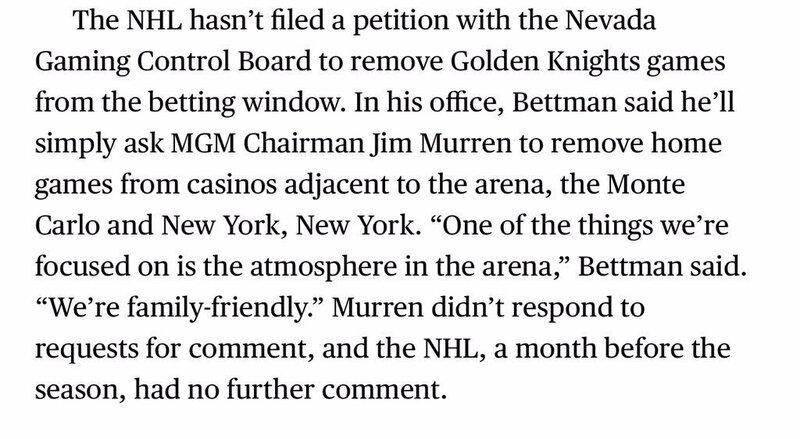 Probably the old canard about casinos causing crime, and we don't want any crime near the arena to scare off the fans. Yeah, in a world where automobiles and the Internet exist, what does removing bet capability from adjacent buildings really accomplish? Is this a wink, wink type of thing to placate someone? Otherwise not sure what this is actually solving. As noted above MGM has a mobile app for anyone in Vegas. You can be sitting in the rink betting on the Knights. The only thing I can think of given his "family friendly" quip is that they don't want last minute "fans" putting down bets, getting tickets to the game, and turning into belligerent douches in the crowd if their bet doesn't go their way. I hate being near salty gamblers when they're losing. Every lottery in Canada has betting on sports lines. Is Bettman prepared to shut down every little convenience store’s ability to sell ProLine tickets just because the Jets or Leafs are nearby? The only thing I can think of given his "family friendly" quip is that they don't want last minute "fans" putting down bets, getting tickets to the game, and turning into belligerent douches in the crowd their the bet doesn't go their way. I hate being near salty gamblers when they're losing. The point of my automobiles and Internet comment is that people will be able to do that regardless of whether the adjacent buildings carry the game. Yeah I get your point and that's why I emphasized "last minute" i.e. fans who are in the adjacent area who on an impulse buy a ticket to the game and make a bet to make the game more interesting. Perhaps they want to limit that. Not saying this is the NHL's thinking, but I can't really think of many other reasons here. You’re not technically wrong, but Vegas was awarded NHL team a lot more than 4 months ago.